Easy setup is the key to the successful use of hydraulic shock dampers. Setting up hydraulic shock dampers should be no more difficult than setting up tooling. External Access to internal orifices for quick and easy set up adjustments is essential. If the dampers require disassembly in order to change internal orifices they are quickly discarded and are perceived to be a faulty product. Therefore, always confirm adjustability. Hydraulic shock dampers should have the ability to monitor the internal pressure and temperature. Monitoring the internal pressure will confirm if the dampers are performing to their capacity. A temperature gauge is only necessary during high-speed applications. The seals are greatly affected by heat. Knowing the operation temperature of the dampers will give clues to the potential seal life or will indicate that a cooling circuit is required. 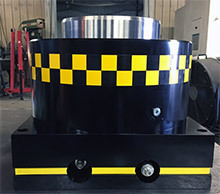 A safety pressure relief system should be designed into the hydraulic shock damper. Every damper will be designed to a pressure rating (5000 psi). A relief valve will ensure that the damper cannot be over pressured.